The Aldrich Family may not have never used that in their intro, but the Holidays were an important part of their world, just like it is in ours. In fact, Yuletide greetings took center-stage in June 1942, the summer Henry and his best friend Homer decided to make some extra money selling Christmas cards. 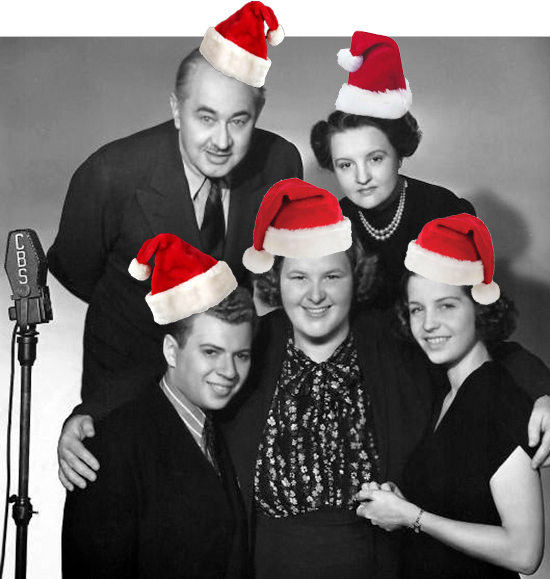 The Family spent Christmas Eve of 1944 with The Kate Smith Show, the venue where they achieved popularity before getting their own show as a summer replacement for The Jack Benny Program in 1939. It was Kate Smith's director, Bob Welsh, who came up with the "Henreeee! Henree Al-drich!" Henry and the whole Aldrich gang have a firm handle on what is really important at Christmas, of course: PRESENTS! Whether it's finding a subtle way to let your parents know what you really want, or trying to borrow four dollars so that you can get your best girl a present as good as the one you think she is going to get you, Henry has learned a thing or two about presents! Maybe not so much about girls. The real joy of The Aldrich Family, as well as Christmas, is to the chance to see the world through the innocent eyes of a child, which is something we should all enjoy at least once a year. Even if that view is slightly distorted by a best friend like Homer Brown! First of all I would like to thank you for having a profound impact on my life by making programs from the Golden Age of radio available to the the public. I am a graduate with a degree in Radio Broadcasting. Thus, I have an added appreciation of the excellent programming and production from the 40's and 50's. I am a huge fan of Escape!, the Phil Harris & Alice Faye show, and especially X Minus 1, Macabre, and the Black Museum, of which I own collections (X Minus 1 turned me into a pulp fiction collector, and amateur short sci-fi writer).